2 March 2015, at 9:48a.m. US - It’s probably a little early to strike up the band on “Happy Days Are Here Again“, but Friday’s announcement of a deal between the ports and the longshoremen is at least reason to get them tuning up their instruments, writes Steve Meyer for the National Hog Farmer. It was the first piece of solid good news for this market in a while and will certainly slow the tide of negativism that has pushed hog prices to their lowest level since the fall of 2010. The Pacific Maritime Association and the Longshoremen and Warehouse Workers announced Friday that they had reached a five-year agreement when they overcame a hurdle regarding how arbitration would be accomplished in future disputes. Secretary of Labor Thomas Perez apparently brokered the deal and said Friday that the two sides had agreed to get the ports up to speed as quickly as Saturday evening. News report today indicate that all 29 ports are indeed back up and running. Working through the backlog, of course, is going to take a while. Many observers have estimated that clearing the docks and the moored ships could take three to four months, during which export flow may still not get back to normal. But we have to walk before we run and it’s time to get started. Lean Hogs futures contracts are up more than $1 per pound, carcass weight, as of mid-session on Monday. The U.S. Department of Agriculture’s Cold Storage report, released Friday, confirms that pork was backing up in freezers in January with Jan. 31 stocks up over 18 per cent from those of Dec. 31. Freezer inventory data for all meats and poultry appear in Figure 1. 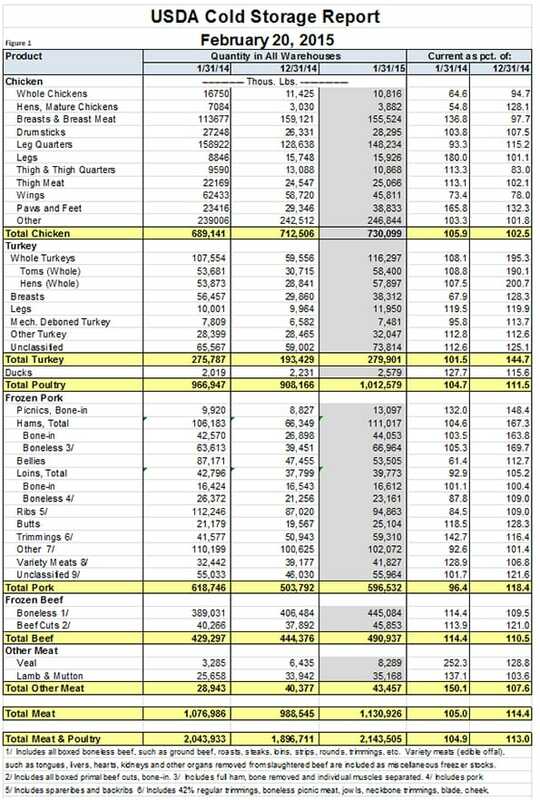 The port slowdown is not the only reason for the amount of every cut in freezers being higher at the end of January but the large increase for hams, picnics and butts suggest that all was not well with exports during the month. The 3.6 per cent year-on-year decline was driven by a large reduction in bellies and ribs stocks. Trimmings, on the other hand, saw their stocks increase by 43 per cent from one year ago. We are concerned that trimmings may be heading for some rough sledding this spring give the huge increases (+14.4 per cent year-on-year and +9.5 per cent month-on-month) in stocks of boneless beef – a product which continues to flow into the United States on the strength of the dollar. Frozen chicken inventories were up 4.7 per cent from Dec. 31 and 11.5 per cent from one year ago. 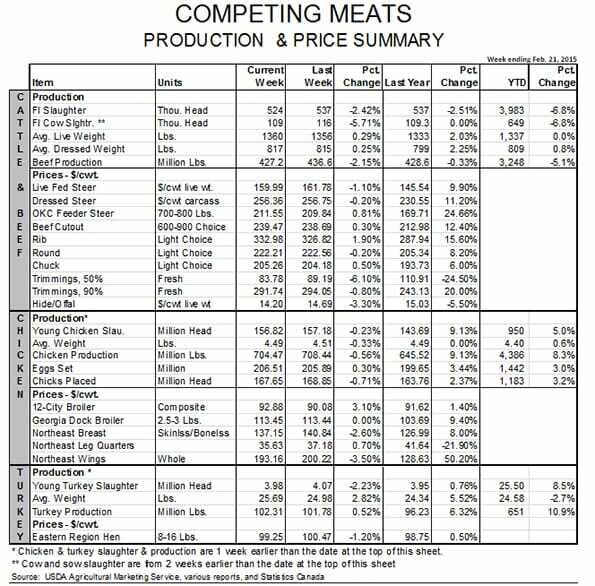 We viewed this report as bearish for beef and chicken and neutral to slightly bearish for pork. But, what about hog and pork supplies? They are big and bigger than anyone expected at this time. First quarter slaughter was 8.2 per cent larger last week versus one year ago, bringing the year-to-date total to +4.3 per cent There is little doubt that a good portion of that is due to “pulled-ahead” marketings relative to the normal marketing pace we had expected. That “rush” of marketings also got a push from the higher-than-expected number of pigs coming behind the hogs now in finishing barns. Harvest has been roughly 650,000 head more so far this year. That number fits pretty well with one-and-one-half days’ worth of slaughter and the 2.7 pound decline in slaughter weights since the first of the year. If the “getting current” argument is correct, we should see a decline in slaughter when the weather warms. If that doesn’t happen we may have to conclude that the December Hogs and Pigs report was off and off big. The report made sense and was internally consistent but that doesn’t necessarily mean it was right. The next few weeks will tell the story.